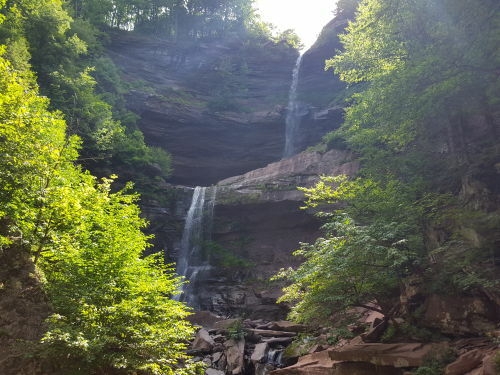 Visions of an Art Trail past – Kaaterskill Falls. We continue our tour of the Hudson River Art Trail. This week we are at stop five, Kaaterskill Falls. It’s a location where a small stream, some people call it Lake Creek, has created a large waterfall. We come here as the strangest of tourists; we come to see the sites the great landscape artists painted, and they are wondrous. We find our way to the very top of Kaaterskill Falls and we stand and stare at the beauty of this location. We gaze down the canyon below us and see as far as the great clove that lies beyond. But we are not here just to drink in the beauty of the scenes, marvelous as they may be; we are here to discover the ice age past that created what is here. Our theme, all along in this series, has been to argue that it was the Ice Age that shaped the landscapes that the great Hudson River artists painted. At Kaaterskill Falls we are very conscious that we stand in the very footsteps of those many artists. We know that Thomas Cole visited in the 1820’s. He painted here and that was the making of the man. But there were so many others; they all came here and many of them also painted the spot. Asher Brown Durand, Sanford Robinson Gifford, William Henry Bartlett, Winslow Homer and many others worked at these falls. Currier and Ives also produced several views. 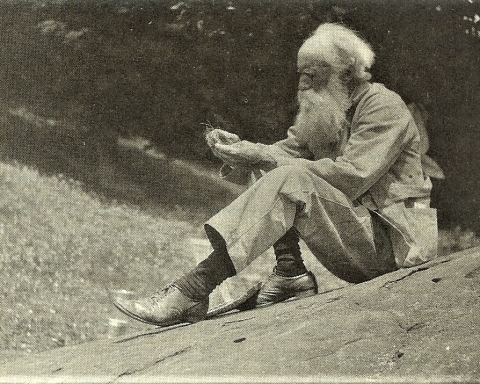 Gifford even carved his name into the enormous boulder at the very top of the falls. To stand at the top of Kaaterskill Falls is to be closely crowded by spirits all around you. 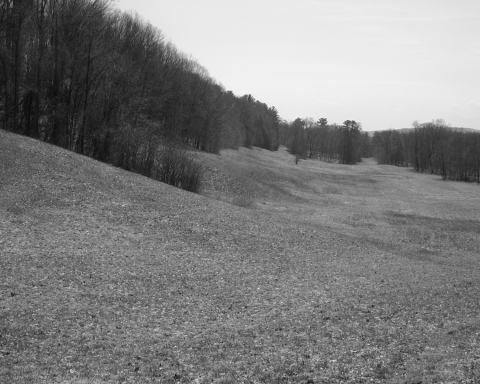 This is the exact site where the Hudson River School began; it is historic. But there are several ways to enjoy these falls. The view from the top is the easiest to access and it is quite scenic. You take Rte. 23A to County Rte. 16 and follow that to Laurel House Road. Turn onto that road and park at its end. Take the short hike down the old dirt path and you have arrived at the top of the falls. That is a dangerous place; people have fallen to their deaths here so be careful. A well-marked new trail will take you to very safe platform that overlooks the falls. In the long ago past there was another good viewpoint nearby. 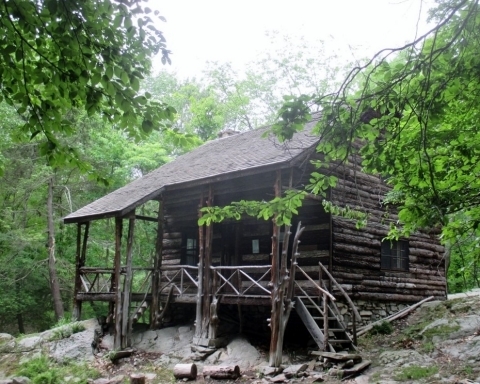 It was a location called “Prospect Rock.” That was where you could look back at the falls from a high up perch. That view was quite nearly obscured by the trees which had grown back over time. You take the long abandoned railroad line south from the Laurel House parking area, and if you know somebody who can show you where to climb down a bit, you can find your way to that very spot. Recently, those trees have been cut down so the view has been restored. Another way of enjoying the falls, and one which all area residents should make sure to pursue, is to hike up the yellow trail from below the falls. You drive up Rte. 23A from Palenville, pass by Bastion Falls, and park at the lot just up the road. Hike back down and begin an ascent just to the right of the stream. About a half hour later you will arrive at the bottom of the falls. It’s a grand scene to view from below. Thomas Cole and many others painted this outlook of Kaaterskill Falls. A geologist looks up and sees several great ledges of sandstone. These are the cross sections of ancient Devonian age river channels up there. Those sands traveled out of the rising Appalachians, perhaps 380 million years ago, and were deposited in stream channels which eventually hardened into the rock that makes up the falls. Sandstone is very resistant to weathering and erosion and that’s one reason why there even is a Kaaterskill Falls. The ledge at the very top is called the “capstone” of the falls. There is a lot more to the geological story, and that gets us to the falls’ glacial history. That takes us back to some of the latest chapters of the Ice Age. It was late in a time when the glaciers were still melting. Vast amounts of meltwater were pouring out of the high peaks of the Catskills and that includes Lake Creek. For a while, it would be a very busy little stream. There must have been times when the flow of meltwater over the falls would have been truly awesome. 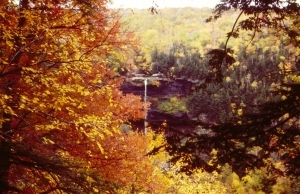 Kaaterskill Falls has been frequently compared to Niagara Falls. The two are almost the same heights. Niagara is just a little bit wider, but they do share some other important similarities. Both lie at the upstream ends of distinct, relatively narrow canyons and that is a clue to their origins. These two canyons are the product of something that might be called waterfall retreat. Each is topped with rugged horizons of stratified rock, their “lips” or capstones. The flows of the two rivers drop off the lips of the two falls. The pounding that occurs at the bottoms of each creates something called a plunge pool. With time the capstone horizon hangs so far over the plunge pool that a collapse in inevitable. With such a collapse the top of the falls has retreated; the process continues and has continued since the end of the Ice Age. 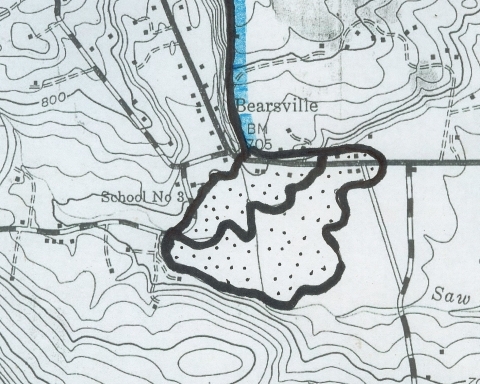 Both Niagara and Kaaterskill Falls have thus been retreating, Niagara for almost eight miles; the smaller Kaaterskill for only a little less than one. 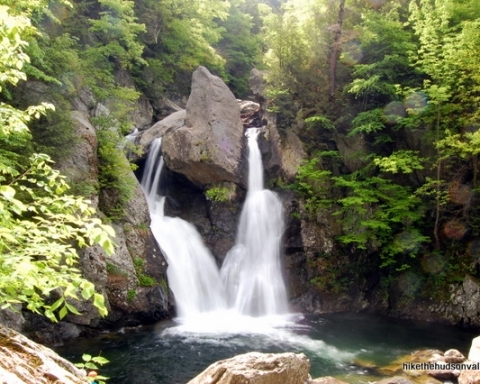 You can see a similar falls/canyon complex at High Falls in the town of Philmont across the Hudson in Columbia County. All this is pretty typical waterfall behavior. But at Kaaterskill Falls there is an unexpected wrinkle. There are features called glacial striations in the canyon, and they appear almost all the way up to the base of the falls. These are scratches that were gouged into the bedrock by an advancing glacier. That suggests that the retreat of Kaaterskill Falls occurred very late in the Ice Age and it was followed by one last re-advance of the ice. A glacier moved up the canyon and added the striations to it. No such thing is likely to have happened at Niagara. We become time travelers; we stand at the very top of Kaaterskill Falls and look down to see a glacier immediately below us. It is a cloudy day and the ice below has a cold gray look to it. Immense crevasses break up the ice. These fractures formed as the ice made its last advance up the canyon. It is warm now, this late in the Ice Age, and the ice has stopped moving forward; it is melting. We can’t see the meltwater up here; we can only hear it as it drains downslope toward the main body of Kaaterskill Clove. It is a very loud sound that we hear.